For companies, this scenario leads to breakthroughs in productivity, customer service, profitability, and shareholder value. For individuals, it means better health, stronger relationships with family and friends, and greater happiness. We sketches the landscape of today's changing job environment and gives managers and individual employees alike a road map to full engagement. 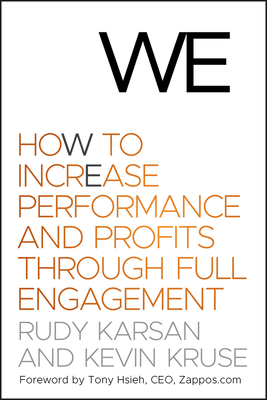 Rudy Karsan is cofounder, Chairman, and CEO of Kenexa, a global provider of business solutions for human resources. Kenexa studies human behavior and team dynamics in the workplace, and using software solutions, content, and services helps organizations improve business outcomes through human resources. With offices in twenty countries and more than 2,000 employees, Kenexa's products and services have touched the lives of more than 150 million people globally. Under Rudy's leadership, Kenexa has received multiple awards of recognition including Forbes Fastest Growing Technology Companies, Deloitte Technology Fast 500, and Software Magazine's Annual Software 500. Rudy attributes his personal success to the unconditional support of his family, which he considers his greatest achievement. For more information, visit www.kenexa.com. Kevin Kruse is a serial entrepreneur, CEO of Kru Research, and cofounder of the e-Patient Connections conference. He lectures to organizations around the world on business excellence and the new world of work. He lives with his family in Bucks County, Pennsylvania. For more information, visit www.kevinkruse.com.